We love are little beach town and feel privileged to call it home. When we are not in Laguna we spend time in Colorado or our airstream exploring new places. Location, location, location....centrally located to everything. Karen couldn't have been more accommodating and accessible. There were (10) of us in all spread throughout the 2 floors and more than enough room. Home was clearly designed and decorated by a Interior Designer with unique touches in every corner. The pool, the courtyards, the water views.....tremendous VALUE for the price. Beds, linens, TVs and furniture have all been updated to make the surroundings very comfortable. The (4) bathrooms were all well done and the (5) bedrooms were equally laid out in terms of space. There were no shortcomings with this home. We looked at a very other rentals in the area for future travels and none compared. Well done Karen. We just cannot say enough Good Things about the Absolutely Amazing time that we had at the beautiful Laguna Beach House! The house and it's furnishings look like a Movie Set! When our rental time was over.....we just did not want to leave! The location is stunning and so easy to walk to the beach. Our hostess Karen anticipated our every need. There were fresh flowers and wine upon our arrival. In the evening we sat outside in the rocking chairs and had wine and watched the perfect sunsets. The house is so totally private and yet gourmet restaurants and shops are just five minutes away. We have decided to make this an annual trip for us! The house is generally good, and the style of this house is great, but it's not well organised and the house was full of the owner's personal stuff, spiders every where. Too much furniture which makes the house unconfortable and not organised. the pool was cold, Jacuzzi was not working and when we called the owner she sent us an email with no attachment. I was very surprised at this review and believe the main problem was the substantial language barrier as this guest had great difficulty understanding English and in understanding both the written instructions for working televisions, stereos and Jacuzzi and verbal communications when he called seeking assistance in turning on the televisions, stereo and Jacuzzi. As with all my guests I want their stay to be as comfortable as possible and I am available by phone and email for all of their needs and concerns: My availability to this guest was no different and I patiently communicated with him and asked each time if he understood what I was saying and if not, that I would have my maintenance man come by to physically show him how things worked. I have never had a complaint of too much furniture, and find that particularly unusual: Indeed, my home has been photographed interior and exterior for publication in several design and architectural magazines with the furniture as it is. In the summer months with the French doors and windows open it is quite possible for a spider or bug to come in. Prior to any new guest arriving, my seasoned cleaning crew performs a thorough floor to ceiling cleaning of the property. This home is a beautiful Laguna Beach property and the beach is by definition conducive to opening windows to hear the surf crashing, and open French Doors to enjoy the breeze. Indeed, prior to the guests arriving I instruct my cleaning crew to open all French Doors and all windows so that upon arrival, the guests get the feel of Laguna Beach as it is meant to be felt. The pool is heated to 85 all summer and the Jacuzzi instructions are in the guest book as well as emailed to each guest. As this was a large party I opened an extra room for them that is not normally included in the rental as a courtesy to the guest and explained to him that we store some personal things in that room but that I wanted him to have access to it if it made the stay more comfortable. This is a wonderful Property in a great location. Features lots of great amenities. My family and I had the best time here. The owner is extremely helpful and courteous. 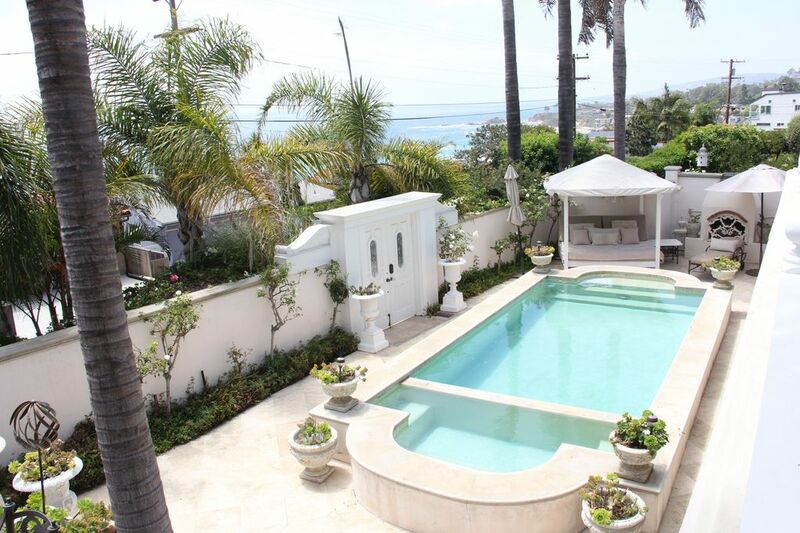 I grew up in Laguna and was delighted to find this beautiful property to bring my husband and children. It is charming, inviting and beautifully decorated. We were blessed to have such warm weather in January and were able to enjoy the pool and daybed to the fullest. The ocean views and location were perfect! What a treat. We just had the pleasure of staying in this beautiful home for our annual family vacation. I searched all over Laguna Beach to find a rental in a great location and one with a pool and this home was a treasured find. We walked to the beach down a private little dirt path and then hopped in the pool later in the day to have more fun. The home was large enough to accommodate our 4 children, they each had their own room which made this trip even more relaxing, everyone had their own space. The owner, Karen, is an incredibly gracious host. She made a booklet with all her local hot spots and suggestions. She is kind and helpful and our experience was fantastic overall. We will definitely be staying here again when we visit Laguna Beach. The town and the home were perfect for a family vacation.